Keith: I’m from outer Portland, essentially Beaverton. I went to Beaverton High School and college in Bloomington, Indiana. Kira, you’re from Oklahoma? What was it like growing up there? Kira: I grew up in an affluent part of Oklahoma City. I went to private school my entire life, then catholic high school for one year. My big rebellion was deciding I wanted to go to a public high school to finish. There I continued to rebel in all the ways I could, i.e. reading Bukowski and drinking too much. It was a sheltered environment, but my upbringing was a bit chaotic. My mom struggled with addiction issues, and my father and I had a complicated relationship, though I’m close to both of them now. I inherited my deep love for art from my father and any artistic talent I may have from my mother, who played multiple instruments and sang. She instilled music in me from a young age, and my father, literature and a general feeling of longing, romanticism even. I have to ask, have you ever been in a tornado? Do you miss thunderstorms? Kira: I have been in many, one very dangerous one, but luckily no one I have ever known has died in one. My family and friends are safe, but my thoughts are with those who weren’t as lucky. And yes I do miss thunderstorms! I love that sound while you’re falling asleep, though I was terrified of them when I was a kid. However, I was terrified of everything as a kid. Did you always pursue music? Why did you choose to relocate to Portland? Kira: Oklahoma City has come quite a long way regarding venues and avenues for young artists to grow and find community, but to sum up simply why I left, when I was growing up being an artist was not part of the consciousness there, it simply was not a possibility one considered. I didn’t always specifically pursue music, but I always knew I wanted something else than what was being offered to me. Complacency terrifies me; or rather, my capacity for complacency terrifies me. How did you come to call yourself Muscle & Marrow? Kira: The phrase “Muscle and Marrow” was taken from a poem I wrote. I like to think that both the muscle and the marrow is inside myself and Keith, metaphorically speaking, instead of one of us being the marrow and one of us being the muscle. 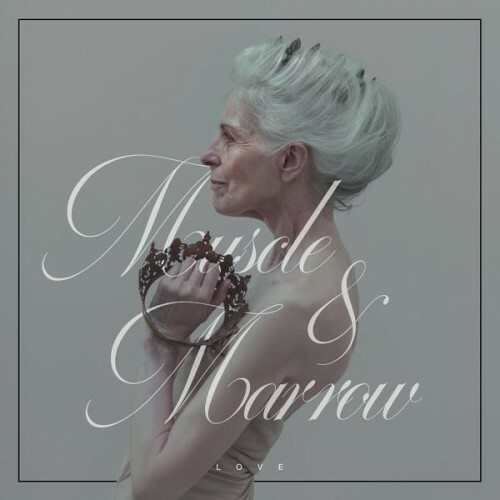 Marrow is a reference to bone, to the fragility of life, to what can be fractured, and muscle to strength and redemption. When I wrote the poem my life was in the process of completely changing, and of being put back together again. I was rebuilding the story for myself and I wanted a phrase that could hold both the break and the restoration. You also work as a writer and editor? What are some differences and similarities between writing/editing books and the songwriting process? Kira: I’m an editor and writer for Housefire books, a small press here in Portland, and just finished editing an ebook by John Barrios, a local writer. Primarily however my focus is very much on music currently, though I grieve having the luxury and time to write the way I used to. I love both mediums because there are things I could say in a poem I could never say in a song and vice versa, though I am trying, as I evolve, to merge those two things more and more. The song “Eager Little Mouth” has some pretty bizarre and violent images in it, which is much more like the poems I write, so that’s the direction I want to keep going. When I first started writing songs I wrote much more simplistically, lyrically speaking, and the songs were more like straightforward regret or heartbreak. Now I joke it’s more like an abstraction of general self-loathing (or fear, or isolation, or anger). I like lyrics that can dismantle you. Those are my favorite poems too, the ones where you sort of die because you surrender yourself to a different language and world. When I write poems or stories, I sit in front of my typewriter in my pajamas and occasionally pace around the house. When I write songs I sit with my guitar in my pajamas and occasionally pace around the house. The processes are different in the sense that my poems tend to be extremely verbose, whereas our songs tend to gravitate more towards wailing, some sort of primitive release, devoid of cognition even at times. Who are some of your favorite authors and musicians? Kira: For musicians: Scout Niblett, St Vincent, Shannon Wright, Chelsea Wolfe, Mount Eerie, Liars. Some of my favorite authors are Virginia Woolf, Dorothea Lasky, David Foster Wallace, Lindsay Ruoff. Keith: For music my current favorite musicians are Swans, Silver Mt Zion, King Dude, and Vic Chesnutt. So, you are a couple. How did the two of you meet? It seems you didn't originally plan to play together. He was helping to produce and yet you seem to be flowing well on stage and gaining attention. You mentioned in another interview that it takes the relationship to another level? Keith: We met in a bookstore. Things evolved organically. I went from producing and playing drums on the recordings to being a full time band member and we’re both happy with the way things turned out. What was the recording process like for the Eager Little Mouth EP? Any plans to get anything on cassette or vinyl? Kira: The recording process took place in my basement and they don’t necessarily reflect our current live sound anymore so we have plans to record a full length in October(ish) and hopefully yes that will be out on vinyl. Keith: A big part of recording music is knowing when your ideas should prevail and when the artist’s should, when to listen and when to speak. That line becomes less clearly defined when you’re working with someone with whom you have an intimate relationship so the recording process at times for me was atypical, but now that we have been working together for a significant amount of time and evolving musically we feel much more prepared to head back into the studio and much more comfortable collaborating. What can you tell me about the plans for the future full-length? Kira: We’re thinking around October we’ll head into the studio, after taking August and September off to finish writing some songs and prepare to record. There will be a different version of the song “Eager Little Mouth” on it, but other than that it will be all new songs. We’re fortunate to have some special guests on one song for vocals-my friend Ali of Death Songs, and Dasha who plays bass for Brainstorm. There will be some songs written on piano by Keith as well, which we’re really excited about. Keith: We’re particularly interested in combining different textures and sounds. Instead of something linear we want contrast, droning distortion, thrashing drums with vocals that are sonically pleasing, yet lyrically those vocals can be jarring. And you are starting a short tour soon? Where are you headed? Kira: In July we’re going to Tacoma, Spokane, Olympia and Seattle. After we release the full length, we have plans for a larger tour. Your bio states M&M is "interested in the morose, the ugly, the jarring and the soft." Can you elaborate or give examples of what is meant by that? And how it is projected into the music? There is a lot of distortion, pauses, and dark, emotional vocals. Kira: I love sounds, and I love sounds that aren’t necessarily pretty. Just like the lyrics, I also want you to feel dismantled by some of the sounds we make. I am a woman, and I am a woman who has a “pretty” voice, but I’m also confused, lonely, angry, complex just like everyone else, so to create music that is only pretty has never resonated with me. It’s important to me to create music that communicates something more whole than that, and not to be self-aggrandizing, because I’m not saying we are succeeding in that, but that is the goal, to create sounds that are sometimes ugly, sometimes soft, sometimes jarring through heavy distortion, an emphasis on volume fluctuations, through guttural vocals. I want the music, particularly live, to be so intense, to be such a raw expression of what it is to be alive that you are almost uncomfortable. We’re trying to create another language for you, another world. I’ve always been drawn to a dark aesthetic, to something that although might sound or might be rooted in loneliness, when expressed through art, it can make some lonely person suddenly less lonely, that unifying feeling of collective isolation or sadness or anger. That is a powerful thing. Keith: I have always been drawn to beauty tempered with the grotesque and the vulgar, and that is what we attempt to do, because that is what it feels like to be alive, and it’s what moves us. It seems intuitively to me that that is a universal thing to some extent, and all we can hope for is that some people are also moved by this expression, or even more simply, that we are succeeding in this expression. Then I suppose we can worry about whether other people are also moved by it.